Seriously Spotless, Seriously Scrubbed for Body is made with only the finest natural ingredients to keep your skin feeling soft and rejuvenated! 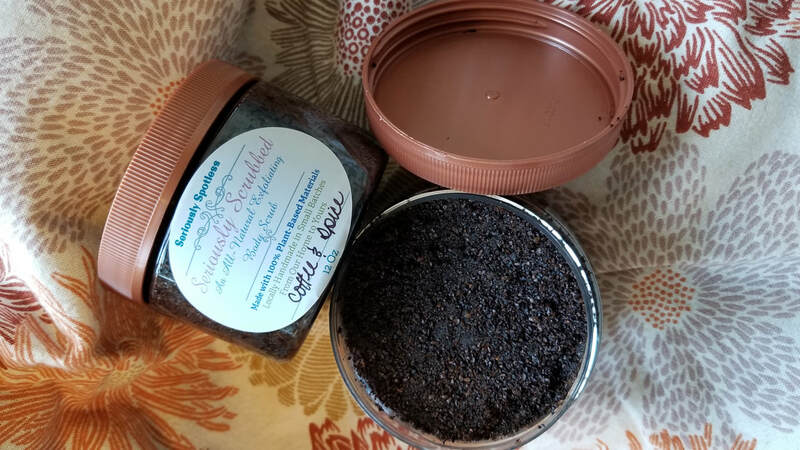 100% Arabica coffee beans and brown sugar will scrub away dead skin cells and help awaken your senses while light and moisturizing coconut oil will replenish essential vitamins back into your skin. Essential oils work in combination with these ingredients to leave your skin feeling happy, healthy, and flawless. Directions: Spread over skin. If using on your face, avoid eye area. Let sit for a few minutes. Gently rub into skin when ready to take off in order to remove dead skin cells and impurities. Rinse with warm water and pat dry. Store in a cool, dry, dark area. Prolonged exposure to sunlight can weaken product. Caution: Although this product is made of completely all-natural ingredients, it is not recommended for consumption. If product comes in contact with eyes or is ingested, flush with water. Please recycle this bottle. If brought back to Seriously Spotless in working condition, discount to next purchase will be applied. Like us on Facebook & Follow us on Instagram! ​Artificial ingredients, preservatives, and animal testing is/are not used in/on our products.